In this post, you’re going to get an extensive list of 11 tips and tactics that you can use to execute social selling like an expert. Your image is just as important in the digital world as it is in the real world. Online, your profile image is the first thing prospective clients will see. Make a good impression with a professional image that isn’t too stuffy, but still makes you look trustworthy and friendly. The copy in your bio on any social network has to accomplish everything a greeting, handshake and an elevator pitch would do in person. Write every word with your prospect in mind and write in the first person, not the third. And be sure to be very clear about sharing your contact info. Share multiple avenues if there is room. On a site like LinkedIn, where you have more real estate to expand upon in your summary section, tell a story about who you are, why you do what you do and how you can help. Remember, LinkedIn is different from a resume. Use your headline not just for your title but for a short phrase explaining how you help your clients. 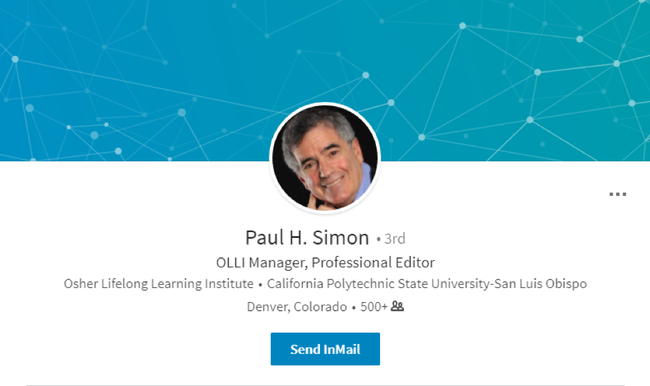 In this case, you can see the profile of Paul H. Simon, who has described himself as a Professional Editor and OLLI Manager. Important details like his location and education history are clearly highlighted. As you expand his bio, there’s a detailed description of what he does and how he helps his clients. Make sure you also highlight your abilities and expertise by getting your colleagues, clients and employees to endorse you for all the skills you have. These skills will be featured prominently in your LinkedIn profile. Your company might have a solid reputation, but do you? Social networks can help you build your personal brand. With every Tweet, LinkedIn comment or Facebook post, you can grow your reputation and establish a solid foundation. It’s a great record of your authenticity and a great place to demonstrate your understanding of your industry and potential clients. This can be achieved by sharing relevant articles about your industry, adding thoughtful insights to conversations and solving problems your prospects may have. It’s all in the name of establishing trust. When you share interesting thoughts, others will re-share them, tag you or start a conversation with you. You can even use LinkedIn’s publishing platform to write original articles relevant to your industry. 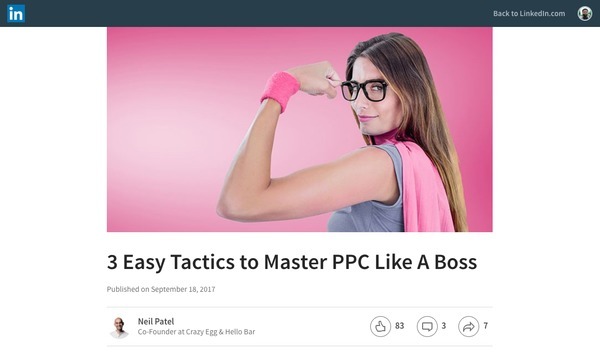 In fact, this is one of the tactics Neil Patel uses to share his marketing expertise and funnel traffic back to his website. Another way to build credibility and social proof on LinkedIn is to ask for recommendations or endorse others in hopes that they’ll endorse you back. Lastly, encourage your network to share and comment and get the conversation started around you. The best way to get better at social selling is by learning from your existing efforts. Collect insights from your current efforts and see what’s effective as well as what isn’t. Based on this data, ask yourself what you should be doing differently and what you can do better. This can help you gain a clearer direction of how you should change and adapt your efforts to deliver even better results. Check out Bambu’s guide to social selling and why it matters here! For example, maybe you’re tracking the activity of your social media referrals and you found that a majority of them leave within seconds. This might be a sign that there’s something wrong with your landing page, and you should take a closer look to see how you can improve it. Or maybe you find that a particular segment of visitors are spending a long time on a specific service page. This will help you gain some insights into how you can frame your messaging and offering if you’re going to reach out to them. You’ll be able to know which features and benefits you should focus on in your outreach. Although it can be challenging to understand how social media referrals are behaving on your site, tools like Leadfeeder can make a huge difference. You can use it to keep an eye on which pages your visitors from social media are viewing. 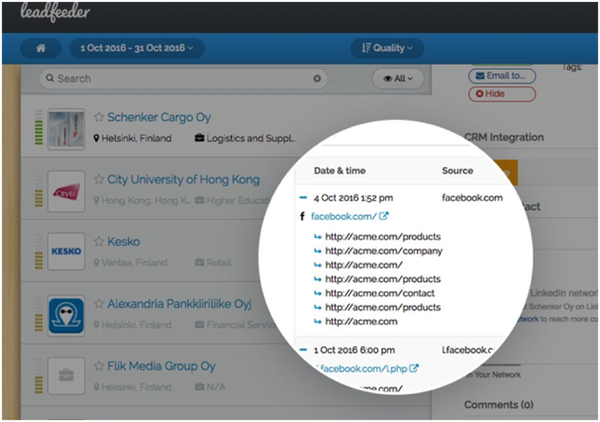 It will also give you insights into the organizations those visitors belong to. This data can help you identify your warmest sales leads and which of your content interests them the most. And with this information, you’ll enhance your messaging so that it appeals to them and delivers better results. The most effective tactic to understand what your prospects want and need is to listen to them. You can then customize your messaging and/or offering based on this knowledge. All you need to do is pay attention to what your prospective and current customers are saying. Monitor relevant conversations about your brand to see what issues existing customers are experiencing. Maybe they’re venting their frustrations about your service on social media. Or they could be raving about you, but mentioning some possible areas that need improvement. You can make use of all of this information to provide solutions to your existing customers and address their issues. So you’ll be nurturing your relationship with them to enhance their loyalty. Social media monitoring also enables you to keep track of other relevant conversations you can use to enhance your social selling strategy. Find out what your target audience is saying about your competitors or the industry in general. Try to discover their pain points, and address them in your marketing material. You can use all the data you’ve collected from social monitoring to customize your communication with prospects and also to decide what kind of marketing on social media would work best. Maybe they shared a blog post that’s relevant to you and you found it really enjoyable. Or maybe you have a shared interest. Either way, you can use all this information to create personalized messages that will set you apart from other brands or businesses. You should also try to look for any mutual connections you might have with your prospects. And instead of reaching out to them on your own, you could get the shared contact to introduce you to the prospect. LinkedIn Groups are an excellent source of prospects for B2B companies. All you need to do is find relevant groups, submit a request to join, and start conversing with members once you get accepted. You can share your valuable expertise and content, ask relevant questions or engage with group members to build a relationship. This relationship that you’ve formed with relevant prospects through LinkedIn Groups can be crucial for nurturing them as leads. You can inform them of new product launches or recommend relevant services that they seem to need based on their conversations. 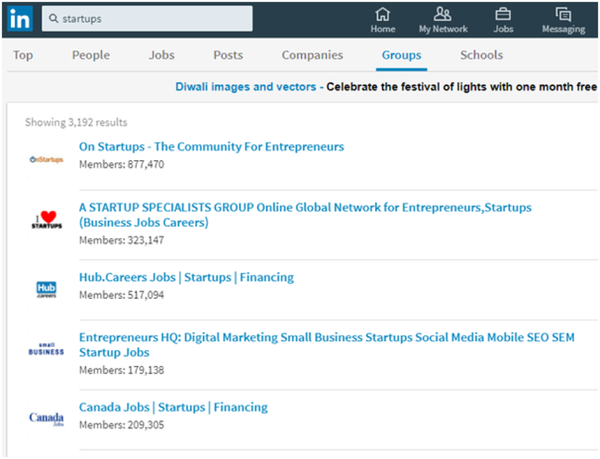 You can easily search for relevant LinkedIn Groups using the right keywords. Make a list of some of the keywords relevant to your industry, service, or product. Enter these keywords in the search window and then filter the results to only show groups. For example, if you offer services or products that would be of help to startup businesses you can use keywords like “startups” to find relevant LinkedIn Groups you can participate in. Social networks are a great place to learn more about your potential clients. Pay attention: where do your potential clients turn to seek more information about problems they may have? Is it a LinkedIn group? A weekly Twitter chat? A private Facebook Group? Plant yourself there, listen to their conversations and get involved. While LinkedIn is the place to turn for business connections, Twitter has a much better search function and has a lower barrier to entry. You can follow anyone you want, from a CEO to a celebrity, and they don’t have to accept your request as they do on LinkedIn or Facebook. They might even follow you back. You can also use the Twitter Chat Schedule on Tweet Reports to discover upcoming and/or trending Twitter chats. Look through conversations relevant to your industry, join in on the chat, and start following the best prospects. Check out #SproutChat, for example. The chat focuses on topics relevant to social media marketers. And you’ll be able to find industry experts in the social media community actively participating in the chat. On Twitter, search certain industry-specific hashtags to see what your potential clients are talking about and what’s important to them. Once you’ve found some prospects, they may be able to lead you to others. For example, see who they are following and start following those people as well. On LinkedIn, some of the best conversations happen in industry-specific groups. Check the profiles of your prospects and see which groups they are a part of, and then join them. Once you’ve found your prospects, stay organized. You can use Twitter Lists to create personalized public or private feeds, which maximize your time. Create a private Twitter List with your top 25 prospects, or create additional lists for competitors, influencers and current customers. Each time you visit the network, visit the list and you’ll get a quick snapshot into the minds of those who matter most, and you can more easily start conversations. 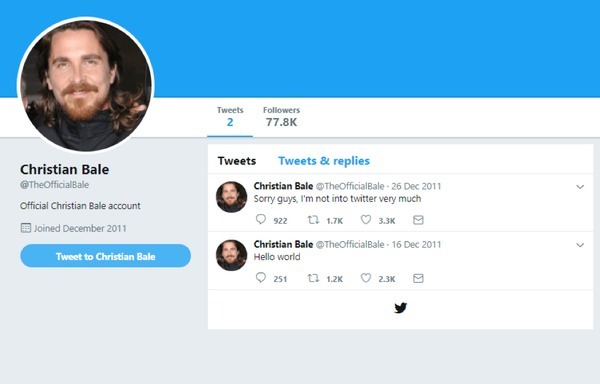 Don’t be like actor Christian Bale, who managed to post just two tweets in six years. Social networks are a time commitment and this is exactly why. Once you’ve started following the right people, you must continuously provide valuable contributions. So choose your network wisely and don’t spread yourself too thin. Every Tweet, comment and post matters and you don’t want to disappear for weeks at a time. An abandoned network looks careless. Always stay focused on the potential buyer. Use relevant hashtags on Twitter to target your content more appropriately. Follow industry influencers so you stay relevant and up to date. If you don’t offer consistent value, there are repercussions. People will unfollow you, block you or hide your notifications. You don’t want to be ignored. You don’t necessarily have to create your own content or fill your feed with generalized tips that appeal to everyone. A crucial aspect to any social etiquette—and especially that of social selling—is to pay attention to and respond to what others are sharing and saying. When starting a conversation or participating in a pre-existing one on a social network (like a Twitter chat) remember that it’s just that, a conversation. Be sure to listen. Every day you should be leaving comments or ‘Liking’ posts from others. More importantly, respond to people who are trying to reach out to you like Salesforce has done in the Tweet below. It’s an easy way to show that you’re listening or to offer up your expertise or insight. It’s also an easy way to find what you have in common. You can also repost something from someone else. When sharing content from another user, be sure to tag or thank them for their initial post. Your company may boast of providing exceptional service or you may be highlighting some impressive features of your product. 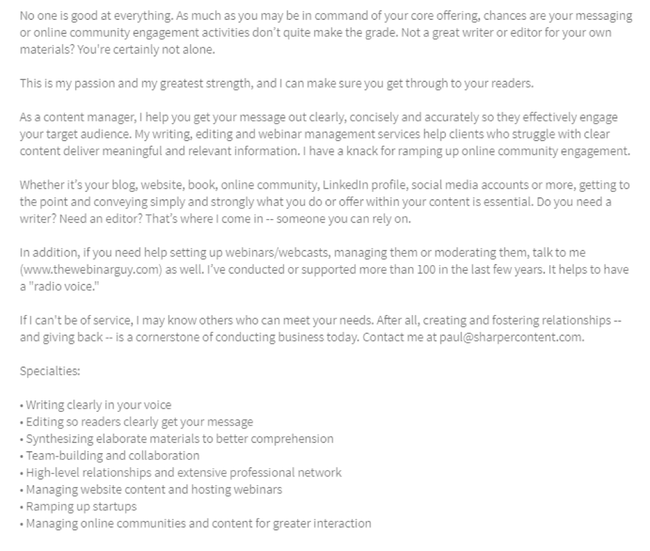 But these are just claims that you’re making and your prospects may not necessarily trust what you’re saying. So if you wish to earn the trust of potential customers, use social media to showcase proof that will back up your claims. This proof would ideally be the success stories and reviews of your existing customers. You can share links to the success stories published on your site. Or you can create custom images with a photo of the customer or the brand logo and a brief summary of the results they achieved with your help. You can even do a full-fledged interview with them and share their story on your social media. Cisco does a great job of sharing success stories on social media. In the following post, they’ve shared a picture with a link to the story of how they’ve helped the SM School District achieve their education goals. Once your prospects see that you’ve delivered impressive results for real people, they’ll be more interested to work with you. You can even encourage your customers to leave reviews about your business on Facebook. Your star rating will be displayed prominently towards the top of your business page as shown in the screenshot below. If your prospects are interested in reading reviews they can click on this star rating section and gain access to all the reviews your existing customers have left about your business. Social selling isn’t just about aggressively promoting your business on social media. Rather, it’s the way you directly and indirectly promote your business through your social media behavior. And this includes your ability to respond to and resolve customer complaints submitted on social media. You’ll be selling your brand name through exceptional customer service. 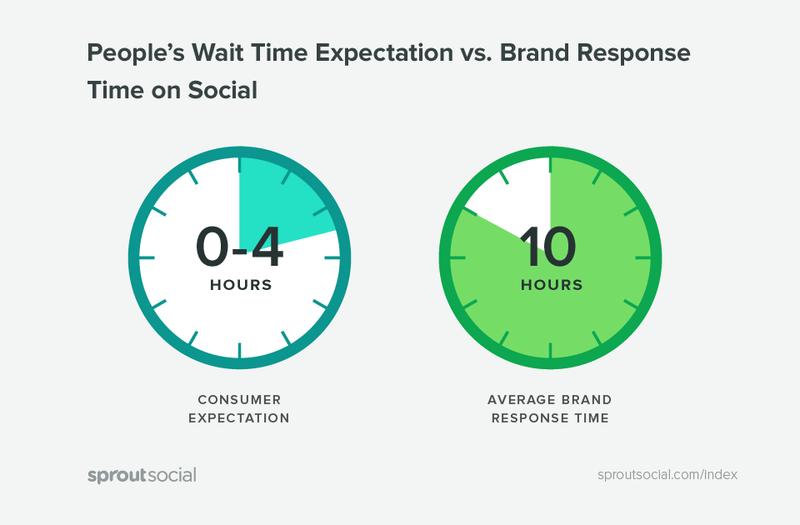 This is crucial because according to the Q2 2016 Sprout Social Index, the average consumer expects brands to reply within four hours. Unfortunately, the average response time is 10 hours. Not only will this help you retain existing customers, but the way you handle complaints can help you win over potential customers as well. Responsiveness and great social customer service are great selling points for new customers. For example, JetBlue uses Twitter to interact with their customers, answer their questions, offer resolutions to their issues and respond to general social media mentions. If you can convert your social media followers to email list subscribers, that’s a great first step. But what you really want to do is convert these digital friends into real life connections. Social media is a great way to establish that warm connection. Once you’ve established a back-and-forth conversation with someone on social, it’s easier to suggest a phone call or coffee date via a Tweet or email. Think about it: an email with a subject line referencing your Twitter conversation may be more likely to get opened. Now it’s up to you to make sure your real-life persona is just as great as your digital one. 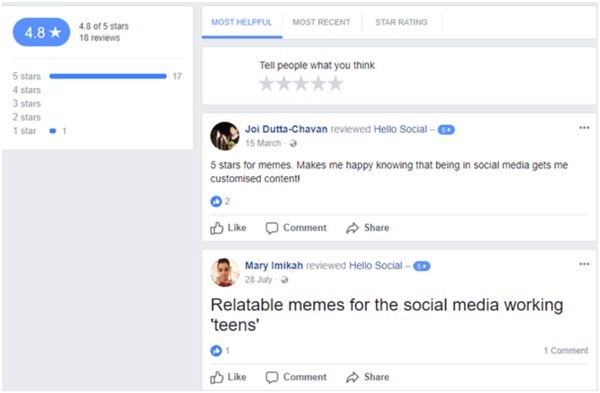 These 11 tips can help you promote your brand effectively through social media, ultimately resulting in loyal customers and increased conversions. When implemented together, these tactics can make a significant difference in your social media performance. Now you just have to develop a comprehensive social selling strategy that will help you make the most of these ideas.